Every season has tastes that define it but none more so than summer. Red tomatoes and basil picked from the backyard; peaches so ripe that juice drips off my chin and fingers when I eat them; and nothing beats really cold, crisp watermelon on a hot day. I start buying watermelons as soon as I see them at the store in early summer. 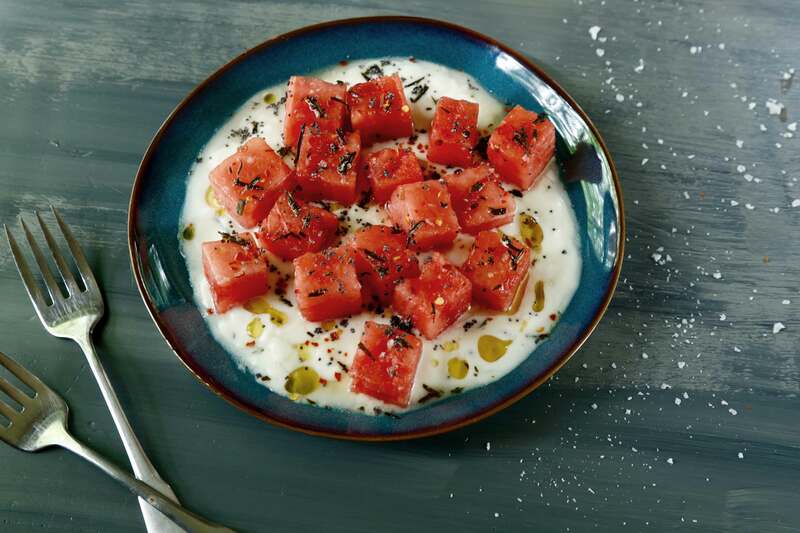 Usually a big bowl of cubes sprinkled with salt is the most elaborate I get but then I saw this recipe for Watermelon with Yogurt and Fried Rosemary in Bon Appétit magazine and I was intrigued. It also helped that I had all the ingredients in the fridge. I adapted the recipe from that in the magazine just a tad. They tossed their watermelon with grapefruit juice which didn’t seem to be necessary, and left puddles on the yogurt, so I removed that step. On the yogurt, go with the whole milk variety. It has a much nicer, creamier consistency than low fat. I especially love the fried rosemary, and the subsequent rosemary oil, so much that I fried up another sprig and used it along with the leftover oil on popcorn and it was amazing. I’ll definitely be making that again. 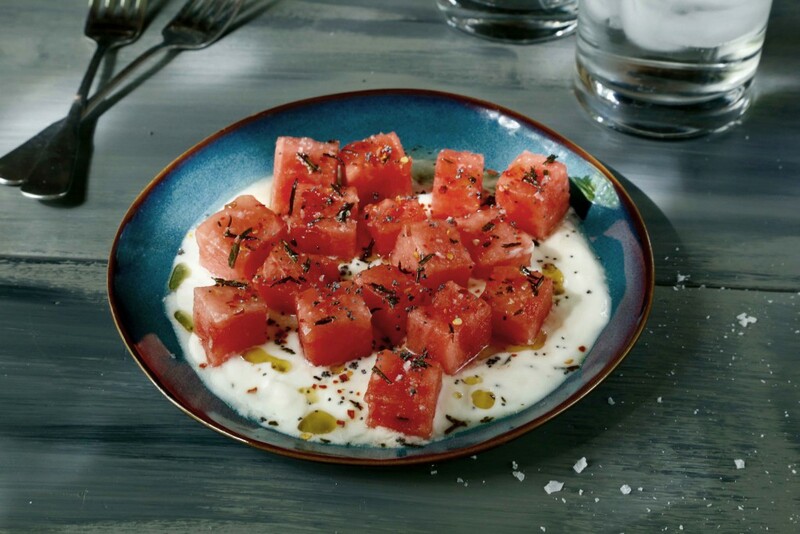 While I still love a bowl of simple watermelon with salt, this recipe for Watermelon with Yogurt and Fried Rosemary gives me another way to enjoy one of my favorite summer flavors. Heat oil in a small skillet over medium heat. Fry rosemary until crisp – about 30 seconds. Transfer to a paper towel to drain. Reserve oil. Mix yogurt with sweetener and season with salt. Spread on platter. Top yogurt with cubed watermelon. Drizzle with a tablespoon of reserved rosemary oil. Sprinkle with salt, crumbled rosemary, crushed red pepper flakes and poppy seeds.